"The Spirit of '76" was originally titled "Yankee Doodle." I must have sang “Yankee Doodle” at least a thousand times over the past 45 years and never really gave a second thought to its meaning. Today, while attending a second grade social studies presentation about the beginnings of our wonderful country, we learned the true meaning of this song. “Yankee,” of course, referred to a name given (by the Dutch) to American settlers. “Doodle” was a derogatory term put on the end of Yankee in order to make Americans seem like bumbling idiots. The part about macaroni was probably the most confusing. I mean, what does a feather in a hat have to do with macaroni? It turns out back in the day, this made a lot of sense. The British were fond of curly, flamboyant wigs. These hair styles were called, “macaroni,” I guess because in some sad way they represented pasta. They poked fun at the American soldiers who adorned their hats with feathers, saying they were trying to emulate their hair styles but not coming close. 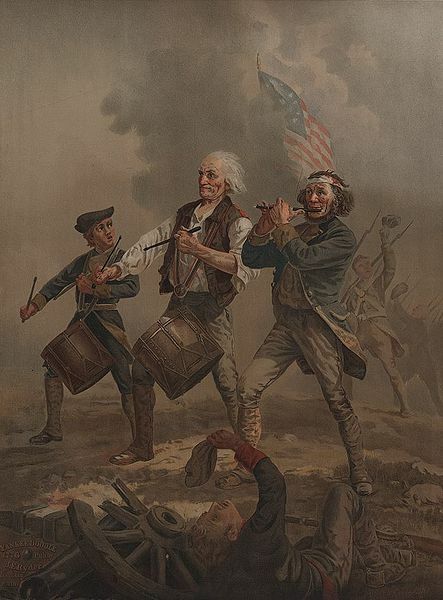 Americans embraced “Yankee Doodle” and sang it every chance they got. A song that was supposed to be negative and derogatory turned out to be a rallying cry. Imagine fighting in the British army and a brigade of American soldiers marches by jauntily singing a song the British composed to be insulting? Now, I can’t find anything to prove this one way or another, but I’m willing to bet the British didn’t spend too much time singing “Yankee Doodle” around their campfires. Not when the Americans were having so much fun with it. Every song, every picture, every article, every blog post, every color and every design has a story behind it. Good writers not only dig deeper to learn origins, but they also dig a little deeper to see if there’s another side of the story they’re missing. Maybe you’re like me and you sang this silly song without wondering what a “Yankee Doodle” was or why it warranted a song. Now that I know a little background, I’ll not only sing it with pride, but I’ll have an amusing picture in my mind to accompany the music. As a writer, Yankee Doodle reminds me that there’s a lot we take for granted and taking things at surface value isn’t enough. There’s always a story, how far are you willing to go to find it? So the British made up a lame little song to insult the American soldiers and what happened? The Americans not only made it their own, but they made it famous. They even added to it. You’d be surprised at how many verses there are to “Yankee Doodle” beyond what we sing at patriotic events. In this case, the negativity didn’t do much for the British morale. Negativity and insults sure feels good sometimes, but it doesn’t always have the intended results. The Americans could have been disheartened by the picture being painted of them as bumbling idiots who can’t tell the difference between a feather and a wig, but they weren’t. They made the most of the situation. They took something that was supposed to be a negative and turned it into an extremely positive situation. So much so that it’s still with us today. The American soldiers were outnumbered, they were short on supplies and could have been short on morale. Every little bit of negativity directed that way could have caused them to lose their self esteem and make the situation seem even more dire. It wasn’t to be though. In true American fashion, our founding fathers made lemonade. I was so impressed by this story, I couldn’t wait to come and work out a blog post. There’s more than three lessons here for sure, but the positivity message shines through. Have you ever taken something at face value, only later to be surprised at the truth and beauty behind it? I had no idea! Thanks so much for sharing this story! .-= ENMFreelancer´s last blog ..Freelance Earnings for February 2010 =-. I had no idea either! Great story and thank you for sharing it.